Big isn’t always better – but in the world of fireworks, it usually is. Fireworks have been used for centuries across the globe as a form of celebration. Since it was invented in 7th century, the world has been obsessed with the colorful displays of pyrotechnics. Nowadays many countries spends millions of dollars on fireworks particularly during new year celebrations. Today we are sharing some of the most popular and well known displays of fireworks from the around the world. The city not only has the world’s tallest building, but it now puts on one of the most impressive New Year’s Eve fireworks displays on the planet. The Fireworks surge out from the Burj Kalifa. If you love fireworks, then make it a point to be in Dubai on December 31st. January 26 is Australia Day, and the biggest celebrations are held in Sydney’s Darling Harbour with a fireworks display that is truly extravagant and mesmerizing. A colourful boat parade also takes place at the same time, adding the amusement in the evening. August 9, Singapore’s National Day is celebrated marking its independence from Malaysia in 1965. It is one of the most elaborate and impressive fireworks displays in the world. Firework teams from across the world deliver display over several days making it one of the longest-running annual fireworks displays on the planet. Malta is such a small island and still puts on one of the most impressive fireworks displays in the entire world. It displays the vast fireworks each year in the last week of April. Many local and Italian fireworks organizations teams up to produce this incredible show of light and sound. The iconic Mount Rushmore is attractive enough when it’s all about lit up at night, but the Independence Day fireworks display that’s held above it takes things to another level. It is one of the most impressive fireworks displays in the U.S. that takes place there each year near Independence Day. Each year, Copacabana Beach lights up with the breathtaking Reveillon fireworks display. Very few fireworks displays can hope to compare to this amazing effort, which just leaves the crowd spellbound. Imagine a month full of fireworks! Well, if you visit Montreal in July , you won’t have to imagine it anymore. Scores of fireworks outfits compete to win the coveted Jupiter Award for Best Show. Each one delivers an innovative 30 minute display. The best one wins the award. But being in Montreal in that month is just super amazing. November 5, Also known as Bonfire Night, celebrating the capture of a certain Mr Fawkes – thus preventing him from blowing the Houses of Parliament to smithereens. Guy Fawkes was one of the key conspirators. No fireworks display list is complete without Guy Fawkes Night. Thunder Over Louisville, the annual kickoff event of the Kentucky Derby Festival, is an airshow and fireworks display in Louisville, Kentucky. It is generally held each April, about two weeks before the first Saturday in May, or Derby Day. 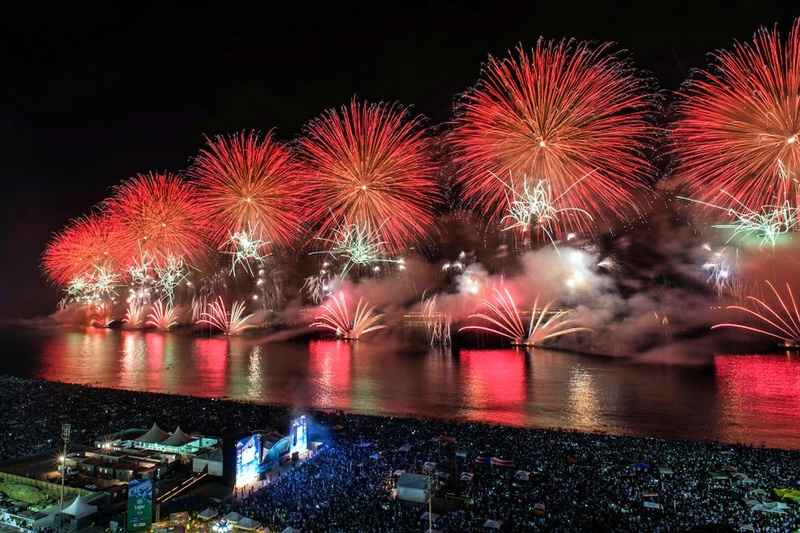 The Pohang International Fireworks Festival is held at Yeongildae Beach in Pohang, which is also known as the “City of Light and Fire.” The festival features a fireworks competition, a parade of lights, street performances, and a range of hands-on activities. It is usually held around the end of July. San Francisco’s topnotch fireworks show on the waterfront is the best thing you can see if you’re going to be in California for the New Year’s Eve. Astonishing fireworks light up the sky above the iconic Golden Gate Bridge, creating memories that are sure to last a lifetime. Hear Big Ben’s famous “bongs” ring out at midnight on New Year’s Eve in London, followed by the UK‘s largest annual fireworks display over the Coca-Cola London Eye, presented by the Mayor of London. Make it a night you’ll never forget at one of the world’s biggest celebrations of its kind. Share your favorite fireworks display in the comments below! Previous Celebrate This Year’s Christmas & New Year At These Beautiful Indian Cities! Next MOST VISITED CITIES IN 2017 ! Wow, such a colourful explosion of colour! The biggest fireworks I’ve seen was maybe Taipei 101 in Taiwan on New Year’s Eve. Thank you for appreciating! 😊 Do share Taiwan fireworks pictures if you have and we would surely add it up in this blog. Please visit ‘Write with us’ section.